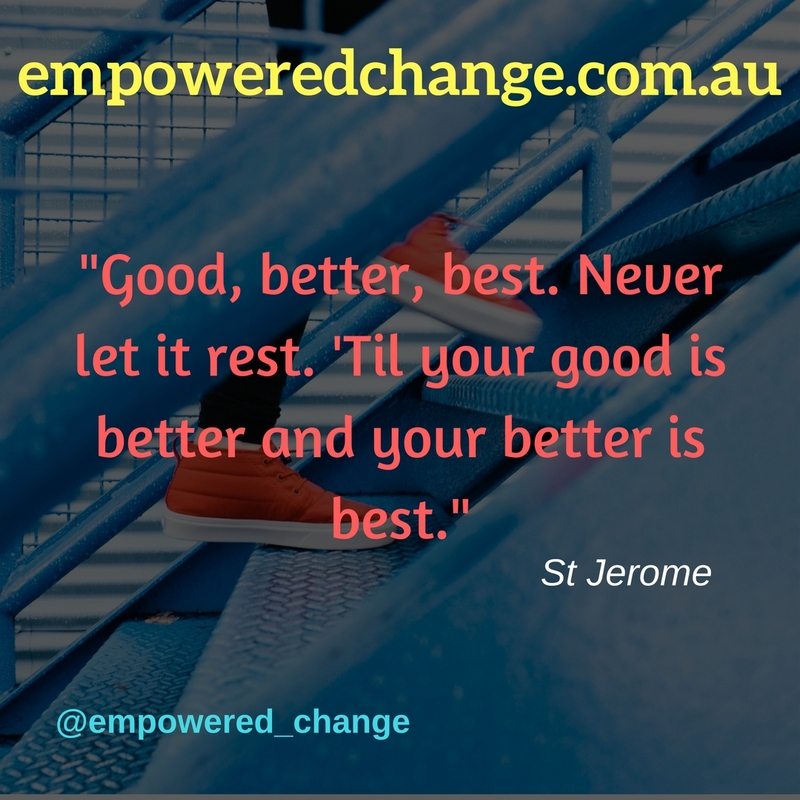 Empowering change to be our best is about being the best we can be within ourselves. We all have enough external measures around us in the world to compare and contrast ourselves. I forever wonder whether this is helpful or not to our change(s). The most important best we can offer ourselves in the process of change, is one that creates and brings happiness, fulfilment and joy. When we are running in tune to the quote ‘good, better, best and never let it rest’ then our ‘good is better and our better is best.’ Such flowing changes are made!! The flow is a pretty good barometer to keep a check on our levels of well-being. When the change is finely tuned, our well-being is at its best and the flow on effect is exponential. There is a deep aliveness within you. Its like you’ve got an endless source of energy which is so easily to share to those around you. You wish it was contagious and love bringing this flow of change to those you love. Being at our best is ‘never letting it rest’ and never taking the focus away from enhancing our well-being. It is the tuning into ourselves at the body, mind, heart and soul levels. We need to facilitate this within all realms of our psyche, the physical, the mental, the emotional and the spiritual. I have observed many clients say they are going to change and rely on their will-power to enforce the necessary changes. Time and time again, they make it for a period of time then old patterns come creeping back in. Our change is not just using the physical and mental realms I believe we need to go deeper and connect to our deepest desire. This desire facilitates our holistic process of deepening the ownership of our change. Our will-power is shown by recent research to be just like a muscle. It gets tired out and we start to experience the internal debate “will I or won’t I” mind games. This exhausts more of our energy resources which is potentially draining. This process begins at the mind level and facilitates emotional fatigue. We can become deflated and disappointed with ourselves as we start feel we are losing sight of being our best. The draining causes the need to rest, a familiar pattern. When we deepen the ownership of our change beyond just the physical and mental we take a more holistic overview to our process of change. How many times have we all promised to keep up the change and before long the internal dialogue starts and our best can start to nose dive. In this nose dive our emotions can be reacting with a level of disappointment and a feeling of failure. This takes up huge amounts of energy and I suspect we are not always fully conscious of it. It does take toll on our happiness and well-being. When we deepen the process of being our best I believe we have access to this gentle wise overview from deep within. It is not our dynamic action oriented physical and mental process that must DO. It is like a deep guide. The more we learn to listen to its wisdom, follow its calling we will reach our best. It is mindful of all the previous attempts at being our best. It is non-judgemental and very mindful of our historic attempts to change. Similar to the wise turtle which offers it essence to steadying the dynamic hare. It has watched and observed the many attempts to ingrain the changes we want. Its guiding voice is not harsh but kind words of encouragement and care. It wisdom accepts, every piece of action towards change, is change. This is us doing our best without never letting it rest because we are coming from our eternal best. This is the best which is better than best – offering deep peace and happiness to our well-being and empowering change! !